Early intervention in children is indicated to help with growth of the jaws and minimize the chance of extraction of permanent teeth or invasive treatment in the future. 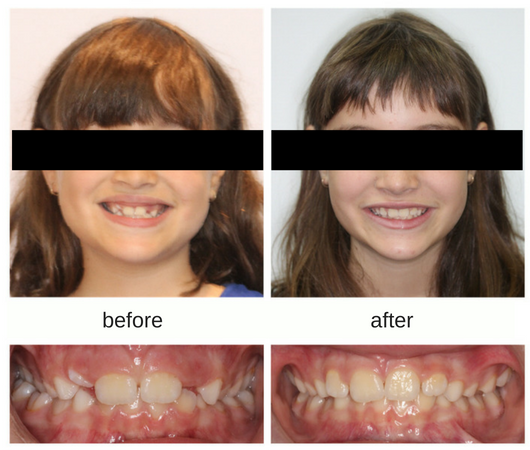 Check out how we helped to give kids healthy, confident smiles with early treatment. 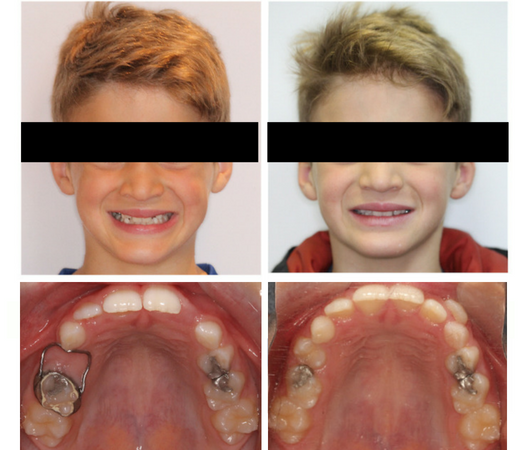 Aaron had an open bite (gap between the upper and lower front teeth) due to a tongue posture habit – the tongue always rested between the upper and lower incisors. A tongue crib was used to retrain the tongue which resulted in spontaneous closure of the open bite. The upper front teeth were also able to come together and the spaces spontaneously closed. Alexa had a crossbite on the left hand side and crowding of the upper from teeth. Expansion of the upper jaw corrected the crossbite and created enough space for the upper front teeth to erupt and align naturally without using braces. Zoe had a crossbite on both sides. She also had an open bite (gap between the upper and lower front teeth) due to a tongue habit. She was treated with an expander in combination with a tongue crib to help with her tongue habit. The upper jaw was expanded to correct the crossbite and the open bite spontaneously resolved itself once the tongue habit was corrected. Jason’s upper jaw was well behind his lower jaw which resulted in an underbite. An expander in combination with a facemask (which was worn very well by Jason) was used to help the upper jaw grow in a forward direction. This helped with the correction of Jason’s facial profile and underbite. It also helped to create space for all the upper front teeth to erupt. Oliver had impacted upper canine teeth. Braces were first installed on the upper jaw and a referral was made to an oral surgeon to create a “window” through the gingiva (gums) so that a gold chain could be bonded to the adult canines. The teeth were then brought in orthodontically into the upper jaw. What a fantastic result! Josh lost his baby tooth a little earlier than expected. A band and loop space maintainer was used to maintain the space for the adult tooth that would eventually erupt. This space maintainer was in place for 2 years and was removed once the upper right first premolar erupted. This is the best type of preventive therapy that can be used to avoid complicated treatment or extraction of adult teeth in the future. This patient had significant crowding of the upper and lower front teeth. We extracted the baby canines on the upper jaw which resulted in erupt of the upper lateral incisors (second set of teeth from the centre). The baby canines in the lower jaw were also extracted which resulted in spontaneous alignment of the lower front teeth. This allows for the patient to maintain proper hygiene and minimizes any future impaction of adult teeth. Katie had a lower jaw that was a little recessive. This was creating a poor bite. A Herbst appliance was used to stimulate the lower jaw to grow while Invisalign was used to help with alignment of the upper and lower teeth. 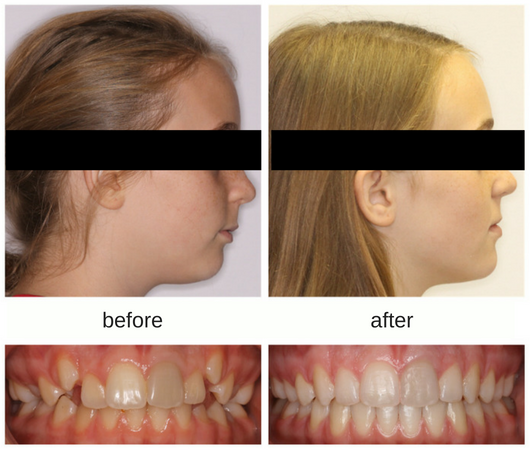 The before and after photos show amazing growth of the lower jaw. Katie wore her Invisalign aligners well, owing to the fantastic smile!